NEECOM meets twice a year and brings together solution providers and the local user communities of manufacturers, retailers, financial services and healthcare who are involved in electronic commerce. Keeping up with the trends as well as end-user presentations that represent considerable achievement by their companies, members and attendees share some great insights on how to manage their IT organizations, as well as enhance their careers. There is a lot of talk about collaborative forecasting1 between trading partners to optimize their businesses. One of the biggest challenges, though, is getting accurate store-level data (that includes ecommerce sites), and making sense of it. 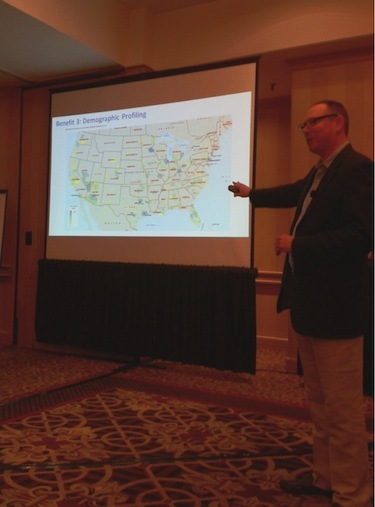 We heard a fantastic talk by Jim Lewis, CEO and Founder of Enhanced Retail Solutions. Jim is ex-JC Penney and his up-and-coming company can boast as major customers both retail and manufacturing companies that have solved huge planning problems for retailers and suppliers. He walked us through how to leverage the data you get from retailers—either retailer portal POS or EDI 852s—to create a winning strategy, i.e., selling the right stuff at the right place and creating a more strategic relationship between the retailer and supplier. You can see how large a data set for a simple product line quickly gets. Past planning models considered the job over once the product was shipped to the DC. But if you really want to know what, and where, the customer bought something—and I think you want to know that pretty badly—then store-level data is crucial to managing your product creation, your supply chain, and creating and sustaining good channel (i.e. retailer) relationships (SALES!!!). So let’s agree on one thing: Understanding the local market (not just the retailer) is critical to managing your business. Sales vary considerably by locale. Since so many consumer product companies still do not have a view of what is happening at the point of experience—the moment before, during, or post-sale, they operate somewhat in a blind side in managing and, ultimately, succeeding at their business. And retailers don’t understand the product being sold across markets or retailers. So they may not know a different assortment or package size might sell better. Why Do You Need Store-level Data and How Do You Get It? Even for high-velocity supply chains there is a huge lag across the product and information chains between trading partners. Relying on shipment data to a DC may mean things have already changed (for better or worse) at the store level and you do not know it. Upside sales are not supported. It’s too late to re-allocate non-performing SKUs or assortments to another channel. Even good POS, though, is only part of the picture in gaining an understanding of your markets. You may know a sale happened, but you may not know why or if another sale will ever happen again. Understand Your Market and Demand Drivers to Create a Long-term Demand Picture. Today, organizations have access to a plethora of data to help them understand the big picture. The Consumer Price Index and other economic data—housing starts, fuel costs, import/export, trade, as well as local information such as events, weather, construction and so much more can help enrich the current picture of what is going on in a locale. Depending on the product category, these data sources become a key part of local analysis to understand demand drivers. And Jim pointed out that much of this data is free, provided by the US government. Of course, analyzing it for your situation does take your own technology. Uncover the Opportunities. Using those 852s tactically yields a gold mine of information for solving the replenishment challenges, through netting out inventory status from POS data and determining on-hand inventory. Then suppliers can understand what the replenishment items (more sales) are for the retailer (sometimes the retailer will actually provide that). If Walmart has 12 turns and Walgreens has 3 turns for your value pack, having 10 weeks of supply for each means “your supply plan is probably in trouble for Walmart,” says Lewis. “But for customers with slower turns [as in our Walgreens example] you’re in good shape.” Simple, right? To support NOOS (never-out-of-stock) means evaluating this data across the stores and the DCs. 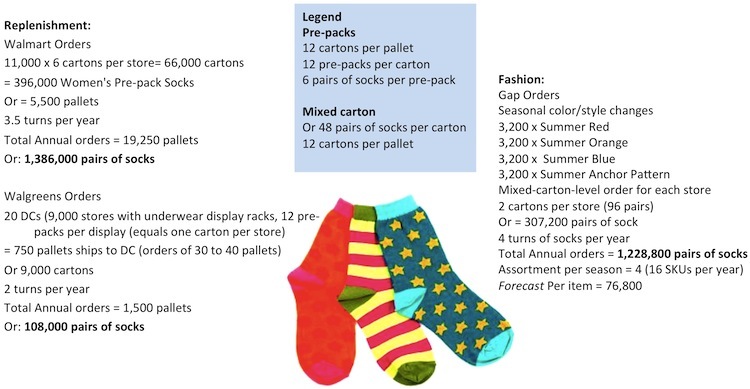 In our Soxi example, we discover that we have a huge excess in California where the weather has been terribly hot and dangerous, so nobody is shopping much, what to say of buying socks. Soxi, rather than shipping more socks which may wind up as excess and get marked down, can suggest a re-allocation from the California DC to Michigan. Here again, the supplier has used that 852 to sort out on-hand inventory for the retailer, saving them money and preserving margin. Grow the Opportunity. One of the important things we have learned about the consumer retail chain is that retailers only know what they sell. They cannot see the opportunity for the brand, category, or product across the market—and especially locally. Soxi knows every product detail—colors and pack-size sales. And now, since they have been evaluating all that POS data, they note the big demand for colors. They approach Walgreens, but Walgreens is not interested. They only stock incidental apparel items. Walmart likes the idea of either mixing up the value pack or offering a second value back with seasonal colors. And Soxi says that lapis blue, orange, and hot pink sell really well on the East Coast. Since Soxi is a valued supplier, Walmart decides to introduce a new fashion pack on a trial basis for a season in the Northeast. Soxi is already in discussions with Gap on next year’s patterned socks deal, so they are not concerned about any channel conflicts. Plus they noted from the data analysis that most of the Gap stores in the Northeast are a minimum of 15 miles away from any Walmart. So although Soxi has not achieved a brand following yet and they don’t have consumer data, they still feel sure that these are reaching different consumers. So with the same channels and products, we now have more sales! Can I say this is the simple stuff? This is data analysis 101, yet many companies don’t get even this far. Get Profitable, Make Margins. Now that Soxi has these basics in place, it is time to really make money by looking at the individual SKUs, what’s moving or not, and what the local-level demand potential may be. Sadly, many manufacturers never get here, relying solely on forecast and replenishment methods. They maintain the status quo, but do not help get those higher margins. Many of today’s retailers are getting very analytic. Thus the supplier has to stay in step. Jim’s challenge was for suppliers to understand what their sell-through and margin contribution will be for the retailer. Retailers today, he said, are expecting so many percentage points of margin from your products. That means they have to reduce out-of-stocks in order to gain mores sales, and reduce assortments that don’t sell well (margin killers). To create the required insights means having item-level intelligence by location. Think about evaluating the local markets: who the buyers are (demographic profiling) and what they might buy from Soxi. Has Soxi had success with this demographic in other markets? Soxi is going to take a deeper look at the SKUs. They are looking at the assortment data more carefully and determining that certain sizes and combination packs sell better in certain regions and with certain groups of consumers. Soxi decides to pare down some of their offerings at Gap to avoid end-of-season markdowns of the larger foot sizes that just are not selling well with Gap customers. In fact, at Banana Republic smaller foot sizes are often out of stock. Looks like an opportunity there, too. In discussions with the Gap, these ideas are discussed and Gap places new purchases for the next season. Again, Soxi is mostly relying on store-level data and associated public sources of local data around those stores. Can we agree that this cannot be done with spreadsheets? Soxi’s demographic analysis sees that certain communities in the Southeast have very large populations of school age children, so they begin discussions with Walmart to offer children’s socks. Walmart buys in on the idea, because Soxi has done their homework and can present the opportunity and data effectively. And Baby Gap? Could be an opportunity there, as well. In a collaborative relationship, Soxi can work with customers like Gap to gain an understanding of their future fashion plans and design products that meet the fashion palettes and themes. Over time, they are winning an “assumptive” or preferential position with their customers because they understand the information that increases sales and minimizes markdowns. Jim discussed the many more benefits, such as finding new channel partners, and effectively tracing promotional ads, that can be gained by leveraging store-level data and local information. There were other great speakers who talked about shortening the cycle of trading partner information, making it easy to get and leverage information. One such speaker was from Liaison, who does not only traditional EDI, but also inter-enterprise business process management and workflow. They described an interesting process for reducing the work involved in designing processes and data integration between trading partners who require standard data (such as EDI). Another interesting company, called CoEnterprise, has a solution called Syncrofy™, a task-based collaboration platform. As collaboration becomes more prominent in the enterprise world, moving beyond transactional-type data to support other informational and dialogue-based exchanges, these task-based collaborative workflows are showing up in trading partner platforms and social collaboration solutions. If one looks at the portfolio of the tech companies mentioned above, for example EDI, tasked-based workflow and demand management, the trading partner cycle is fairly complete in retail and really changes the game—less inventory, more sales, and better trading partner relationships. The rest of the NEECOM experience also offers a great deal of knowledge, making it a high impact experience for members and attendees.